Icom 7610 rig control problems? Having trouble finding software for the Icom 7610? If you are a fan of N3FJP software and Fldigi then this is for you. This works for the Icom IC-7300 too. 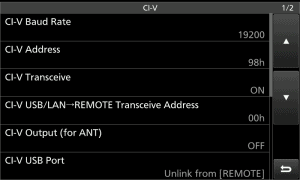 Amateur Contact Log is easy to configure for the Icom 7610 and Fldigi integrates with it beautifully! Fldigi logs right into AC Log. Wow, what a great combo! As of the writing of this post, Icom 7610 owners have to look at rig control alternatives for the Icom IC-7610. Currently Flrig, HamLib and RigCAT do not have files for the Icom 7610. 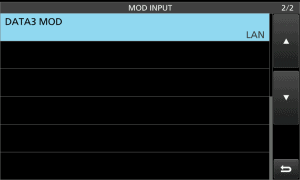 It’s easy to configure N3FJP’s Amateur Contact Log for the Icom IC-7610. Especially if you are replacing a previous radio. Just change the CI-V address in ACLog under Rig Interface to 98 for the IC-7610. Change it to 94 for the IC-7300. For Icom 7610 rig control choose the correct Com Port, Baud Rate and change the Command to Read Frequency CI-V address to 98, Don’t forget the other side, Command To Read Mode. It needs to be 98 too. Try it. For Fldigi to communicate and follow AC Log, enable the Application Program Interface (API) Server in ACLog. Open Fldigi and go to the Fldigi configuration window. Enable a couple of things and you’re off and running. See the video below for more. Since the Icom 7610 is not an entry level radio, I am guessing you are already familiar with how ACLog and Fldigi operate. If you are not familiar, see the video below. I’ll go into a little more detail. When making a contact using Fldigi, Fldigi will save the QSO to ACLog automatically. They intergrate perfectly. Tune the Icom 7610 to change frequency and both programs follow. 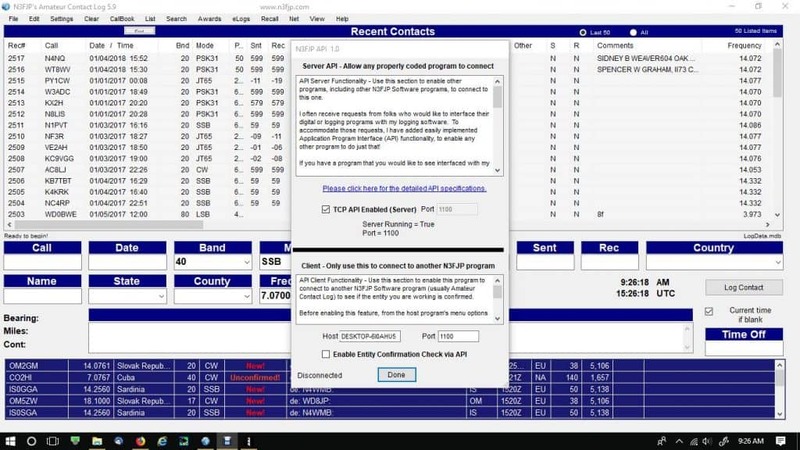 Log a PSK31 (or any digital mode) and the contact/QSO information correctly transfers to AC Log. Note: You’ll have to enter your correct power in ACLog, but everything else will be fine. Have you been using Fldigi with the 7610? 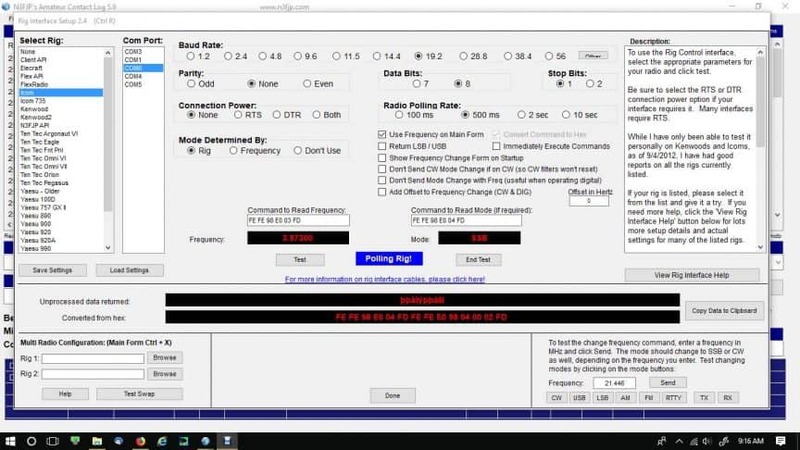 What are you using to connect to the radio? You can see this in my other videos. 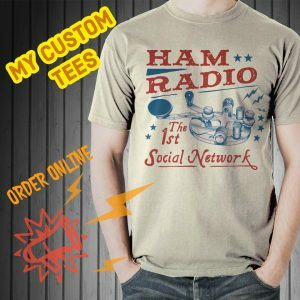 Ham Radio Deluxe Setup and Icom 7610 N1MM One Cable RTTY CW – How To. The first row and bottom 2 photos on the left are important for this application. Note: The capture on the top far right (USB SEND/KEYING), I have set these so I can use my USB cable for RTTY (FSK). This will not be necessary for you in this application. It won’t hurt anything though. IMPORTANT: The bottom 2 on the right (TX DELAY & CW-KEY SET) are needed if you run an amplifier and CW QSK. Push Menu>SET>Connectors for the first 6 captures (top row and two left captures on the bottom row). Push Menu>SET>FUNCTION to set the TX Delay. To change the CW Rise Time. 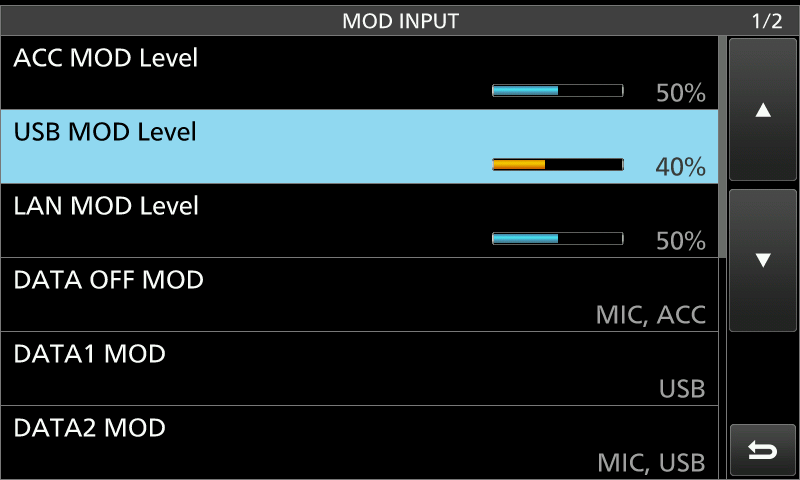 Go into CW Mode, push Menu, KEYER and EDIT/SET. 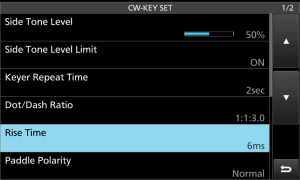 Tap CW-KEY SET and increase the Rise Time. AF Output Level stayed at 50% for recording data signals. Unnecessary until you want to operate thru a LAN. I use this for RTTY (FSK) It works for this application too. Is it possible to get Fldigi to send cw on the 7610 with the keyboard? NOT using SSb audio? Nice to hear from you and that’s a very good question. At one time I was told that it was not possible, but if we use a separate port for CW I don’t see why not. It’s something to look at again. Thank you and when I get back on my 7610 I’ll try it. I looked at it again and the radio needs to be in USB-D1 mode for it to send, so I guess not. If you are using N3FJP you can send CW from it. WOW thanks Rich, Hmmm how do you do that?? Triple checking all settings, hi! Just tried it, it keys the rig, but is not sending. Try checking the settings again. It’s usually something simple. Look at the sound card and port audio in FlDigi. Should be the USB Audio CODEC for both input and output. Cheers all, just getting new 7610 up and running with Flrig and Fldigi. changed CV address to 98, setup per screens above, but new radio FW only allows 8ms delay on tx however I have reed/vacuum relay QSK that works to 3.4ms no problem. I tried the 7300 setting with com6 (first port), 115200 baud matching radio, tried different combinations of RTS/DTR. with 7300 it does initialize, tune works, but it and TX button on Flrig leave transmitter keyed. I don’t use Flrig much but maybe it is RTS/DTR. In the radio go to Menu>Set>Connectors and change the USB Send to OFF. Any plans for a video on connecting the Icom 7610 to a lan system for remote operation? Look forward to the slide. I will e-mail you some screen shots of my Fldigi setup. It can be a pain sometimes, but once it’s going it works FB. For Rig Control and PTT I am using RigCAT. I haven’t used ACLog with Fldigi a whole lot, but I really like N3FJP’s software and he has excellent support on YaHoo forums. Thank you for the comment and it’s nice to see you here. Nice video on interfacing N3FJP and FLDIGI. The 7610 looks like a nice rig, but it will look nicer to me when the price comes down and the many bugs are worked out. Meanwhile, I still like my 7600. I also use N3FJP and it is an excellent logging program. Do you know if the N3FJP/FLDIGI combo works as well on the 7600? Thank you and it’s nice to hear from you. The 7600 is a fine transceiver and I have a friend who loves his. He won’t be giving it up anytime soon. I am sure it would work the same with the 7600. It just a matter of setting up N3FJP and Fldigi to talk to each other and it works very nice. My Question, what cables will I need to go from the computer to the IC-7610 so I can do JT modes, FLdigi etc? I do not see this mentioned in the page here yet. text works as I can still see that with my eyes at this time. Thank you for commenting and I understand. All you need is the USB 2.0 cable. We’re not using the USB 3.0 high speed port yet. Install the driver from Icom first, then attach the cable. You’ll see two COM ports in your computers Device Manager. I have a video explaining those, but long story short, choose the first Silicon Labs CP210x you see in Device Manager for the Com Port in the software. 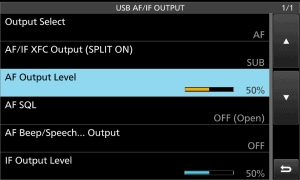 For sound you’ll be using the USB Audio CODEC for input and output in the software. We can accomplish RTTY (FSK) on the rig with a keyboard, but I haven’t attempted that yet. Someday! Fldigi won’t operate in FSK mode, just AFSK. 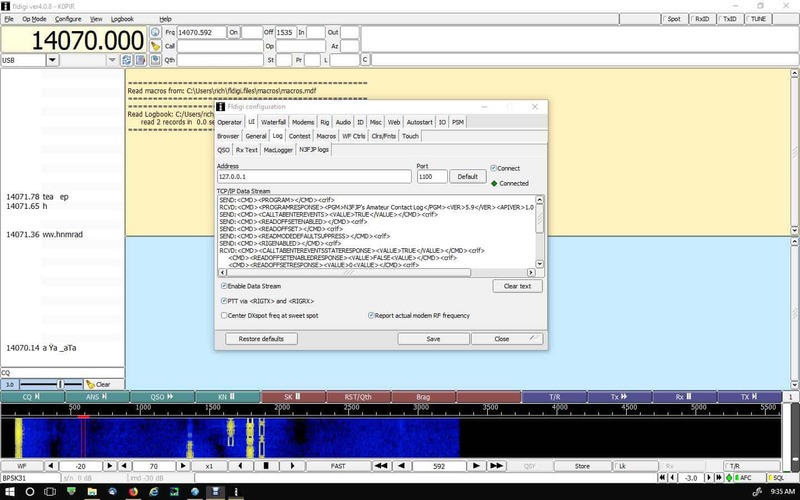 For RTTY (FSK) with a computer a good solution is MMTTY and many use N1MM Logger Plus as a log for it. That last part is not necessary though. We can use MMTTY as a stanalone and import it’s log into our favorite logging program. That last link I use two cables with the Icom 7300, but it is unnecessary with the Icom 7610. The 7610 has two virtual COM ports. That first link explains it. HNY and thank you again. so nobody is playing hi..
That’s what I’ve heard, but I don’t believe it’ll be much longer for them to be delivering in the UK. You can benefit from the mistakes and then corrections we’ve made, hi hi. If you use an amp, remember to set the TX delay. I use an older Ameritron 811 and have the TX Delay set to 20ms. HNY and let us know when you get it.